In a small bowl whisk all the vinaigrette ingredients together. You can add more oil if the sauce is too thick. Set aside. Preheat the oven to 275˚. Rub both sides of each piece of the salmon with olive oil and season with salt and pepper. Place skin side down on a nonstick or foil lined baking sheet. Roast in the oven at 275º for 18 to 22 minutes, depending upon the thickness or until flaky and just cooked through. Thicker pieces will require longer roasting. The salmon will appear very moist. This may be served as a chilled entrée. After the fish is cooked, let it come to room temperature. Loosely cover and refrigerate until serving. The sauce can be covered up to 4 hours ahead of serving and kept at room temperature. 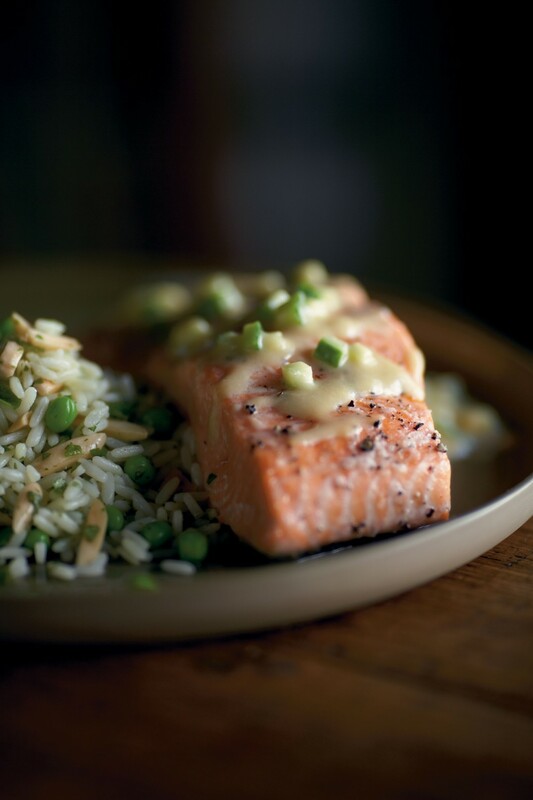 When selecting your salmon, check for a slightly sweet odor and firm flesh. Salmon filets may have “pin” bones (tiny bones). These bones are often buried vertically in the thickest part of the flesh. To remove them press the meat with your fingers and remove any bones that appear. Tweezers come in handy for this job. Serve this with a simple rice pilaf flavored with peas or zucchini and chopped cilantro for a satisfying quick dinner. To drink, why not try a New Zealand Sauvignon Blanc, a California Viogner or a fruity slightly sweet Riesling?